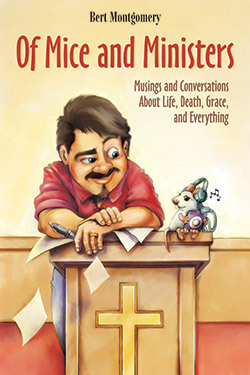 How would you describe your new book, Of Mice and Ministers? What were you hoping to accomplish when you sat down to write this book? (Laughing) I guess “more of the same… but different.” Like the first two books, it’s a collection of reflections and columns written for various different online sites; it covers the same basic stuff—life, death, epiphanies, and rock and roll. It is a little different though, in that it includes a few pieces that directly involve others: conversations with a Baptist legend, a deceased monk, and some musicians I admire. For me, just finishing anything is an accomplishment, so in some ways I was simply hoping to find enough relevant pieces to mold together into another book. I’ve always loved the titles of your pieces. Can you list two or three of your favorite titles from Of Mice and Ministers, talk about their pop culture connections, and describe how they came about? Well, obviously, sometimes I steal the title directly from a song that is the foundation of the musing. “Burden of Belief” and “Everybody Hurts” and “If You Wanna Get to Heaven” are all actual song titles from Daniel Bailey, R.E.M., and the Ozark Mountain Daredevils, respectively. “We’re Gonna Need a Bigger Boat” is a famous line from the movie Jaws. But sometimes I just want to come up with a play on words, or a slightly altered version of a famous phrase. An unpleasant encounter with a rather large mouse in my hotel room led to a personal epiphany about the birth of Jesus—and a sermon the following Sunday during Advent. That sermon was whittled down and altered a little bit, and with a nod to John Steinback, became “Of Mice & Ministers.” Like most readers, Brother to a Dragonfly was the very first book by Will Campbell I ever read; so my musing about Brother Will following his death played with that title and combined it with something he and I had in common—colon surgery; thus, “Brother With a Semi-Colon” was born. I really like the double-meaning of “Listening to the Dead”—which may not excite others, but it’s one of my favorite titles. It refers to our dearly departed, of course, but at the same time, it refers to the Dead (as in the Grateful Dead).